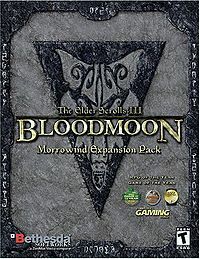 Bloodmoon is the second expansion pack for Morrowind, set on the icy island of Solstheim, northwest of Vvardenfell. As the East Empire Company struggle to establish a new colony on the frozen shores, mysterious occurrences and the arrival of Werewolves begin to transform the land. The native Skaal tribe herald the changes as omens of the Bloodmoon Prophecy, and the start of the dreaded Hunt of Hircine. As the Nerevarine is unwittingly drawn into the hunt, there is only one choice to be made; to become the predator, or the prey. Quests — All quests that can be embarked upon in the expansion. Hints — All sorts of game playing tips and hints to help you enjoy the game more. Items — All the items you can collect on your travels. Souls — A list of new souls to trap in Bloodmoon. Werewolves — Information on the werewolves of Bloodmoon, and how to become one. Creatures — A listing of all creatures found in the Bloodmoon expansion. Factions — A detailed description of Solstheim factions. People — A listing of all people added by the Bloodmoon expansion. NPC Classes — Unique classes introduced for NPCs in the expansion. Places — Major places in the expansion pack. Maps — A bird's-eye view of the island of Solstheim. System Requirements — Minimum and recommended system requirements for the expansion. Easter Eggs — Oddities and references found in the expansion. Glitches — Known glitches and oversights in Bloodmoon. Wallpapers — Official wallpapers, available in various sizes. Esta página foi modificada pela última vez à(s) 14h34min de 26 de janeiro de 2016.